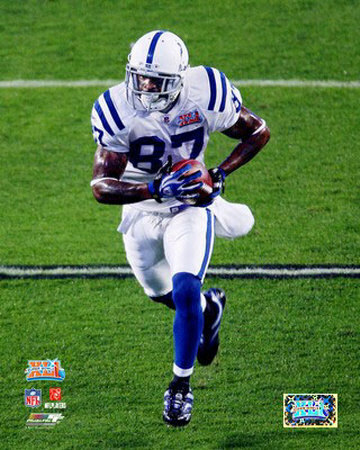 Reggie Wayne is the leading receiver for the Indianapolis Colts offense, one of the most high-powered units in NFL history. This makes Reggie Wayne a major fantasy football star, and probably vaults him in the second round of most 2008 fantasy football drafts. 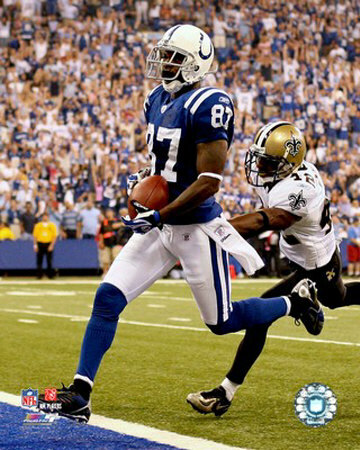 Reggie Wayne has good size (6’1") and speed, which is why he was a 1st pick for the Colts back in 2001. Because of injuries in the Indianapolis Colts offense in 2007, Reggie Wayne became the focus of the offense. He posted his best year as a pro in 8 NFL seasons. Wayne’s size makes him a big target for Peyton Manning, so he can play the roll of a possession receiver. But Reggie Wayne’s speed has long made him Peyton Manning’s most dangerous target, and Wayne was scoring big-play touchdowns long before he supplanted Marvin Harrison as the Colts’ go-to receiver. The fact he can make the tough catch and the long touchdown catch makes Reggie Wayne one of the rare franchise receivers currently in the NFL. Reggie Wayne started his career with the Indianapolis Colts as a part-time starter his first two years (started 16 games over those two seasons). Reggie Wayne was a late 1st round selection by Bill Polian, and Wayne served as a downfield threat his first few seasons. This translated to flashes potential, but inconsistent play in his first two NFL seasons. In his third year, Reggie Wayne became the full-time starter opposite Marvin Harrison, but Harrison continued to receive the bulk of the pass attempts in the Colts offense. Still, Reggie Wayne caught 68 balls for 838 yards and 7 touchdowns in his third year — often expected to be the year young NFL receivers “break out”. In his fourth NFL season, Wayne finally broke the 1,000 plateau, grabbing over 1,200 yards and 12 touchdowns. This year (2004) made Reggie Wayne a fantasy football star. Strangely, in Peyton Manning’s record-setting 2005 year (49 TDs), Reggie Wayne only caught 5 touchdowns and regressed in most categories. This proved to be a one-year situation, as Reggie Wayne has posted his two best NFL seasons in 2006 and 2007, and he has now supplanted Marvin Harrison as the #1 option for Peyton Manning. Reggie Wayne was a major disappointment in the second half of the 2008 fantasy football season. If you had Reggie Wayne in your fantasy playoffs, he let you down and it’s likely he let you down enough to ruin your playoffs. It’s still not certain whether Reggie Wayne just had a bad stretch, whether nagging injuries slowed him down or whether he couldn’t stand up to the double-coverage, once he didn’t have Marvin Harrison to take the pressure off. That leaves Reggie Wayne about 5 spots lower than he was last year, in that 8 to 10 range. Reggie Wayne should be Peyton Manning’s big target outside Dallas Clark, so he deserves the position as a Top 10 receiver on that alone – but I’m not as high on Reggie Wayne as I was last year. I wonder if he’s just not as good as I once thought he was. Terrell Owens. Reggie Wayne is now in the prime of his career, with a Hall-of-Fame quarterback throwing to him. You might not expect to see Reggie Wayne put up quite the numbers he had last year. Marvin Harrison missed most of the season with an injury, and the Colts claim that Harrison is healthy again. This should bring some more balance to the Indianapolis Colts offense, after Manning leaned heavily on Reggie Wayne last season. Also, Anthony Gonzales should continue to grow in his 2nd year as a Colt, so expect to see Peyton Manning target Gonzales a little more. National Football League. I wouldn’t be surprised to see Reggie Wayne score more than 10 touchdowns, though 9 receptions is his average over the past four years. If you’re going to take Reggie Wayne, take him high. He’s going to go in the 2nd round in most fantasy football leagues, and will be a high 2nd rounder in receptions leagues. In fact, given that he’s 5 years younger than Terrell Owens or Randy Moss, some people might target Reggie Wayne as the 1st overall wide receiver in the draft. His position on the Indianapolis Colts offense means he’s about as safe a bet as any wideout in fantasy football. Keep in mind that Peyton Manning just had surgery to remove an infected bursa sac. He should miss 4-6 weeks, which means Peyton Manning will most of the grueling days of training camp. There’s little doubt that Manning will return in plenty of time for the season, and I would expect to see him taking snaps by the 3rd preseason game. The Peyton Manning surgery shouldn’t affect Reggie Wayne’s fantasy football season, but keep an eye on it, just in case.